Hello and welcome to exampundit. 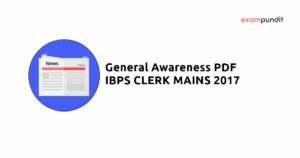 Today we are sharing the General Awareness PDF for IBPS Clerk Mains 2017. This General Awareness PDF for IBPS Clerk Mains 2017 contains all the important current affairs, questions which will help you to score maximum in General Awareness. Detailed Current Affairs of Last 3 Months. We wish you all the best for IBPS Clerk Mains 2017. If this GA PDF helps you, or you like it, simply let us know in the comment section or just mail us at exampundit@gmail.com. For early access to our PDFs and quizzes, install our app today!